The benefits I experienced from quitting caffeine were unexpected, and much more profound than I thought. Increased energy is the classic benefit but the greatest change came with my moods. I hadn't realised that I had an underlying anxiety - caused by caffeine. The way this manifested was that I would periodically get very sad without knowing the reason for it. As far back as I remember, already as a youth, I would occasionally get sad and worried about something. Now, whereas those feelings are quite natural, the difference was that I would suddenly feel sad or worried for no reason. I am now able to take stressful situations better (transdermal magnesium oil helps with this as well) and my energy, as well as the levels of relaxation and happiness, are generally a notch higher. I have more energy in the morning and all throughout the day. The frequent energy slumps during the day, which were caused by caffeine, are gone as well. I would say that after quitting caffeine my emotions stayed the same - although I do feel happy and upbeat more - but it is the unexplained feelings of anxiety that disappear. Another surprising benefit from quitting caffeine was that the work days seem to go quicker! At the same time the weekends and my free time seems to last longer! I know this sounds completely odd and I was quite perplexed about it first as I couldn't understand why I felt that way. I then realised that the reason was that I could concentrate a lot better and so the work seemed easier. As you know, while being very focused on something, time seems to speed up. So in addition to improved concentration, the benefits of quitting caffeine can be said to include easier workdays! I also found that my memory was better and I could think clearer. I felt more intelligent off coffee than on it! If you think these benefits are exaggerated, I recommend you read my book review of Dr. Stephen Cherniske's book: Caffeine Blues, which explains the dangers of caffeine from a more scientific viewpoint. Image courtesy of Maryam Yahyavi. I found this saying on Facebook and it is the absolute truth and the core of what I mean by Cheap Health Revolution. Your body is a lot more powerful than you think and once you stop weakening it by means, such as caffeine, you will discover just how powerful it can be. Life is infinitely better without caffeine. I would have never believed that quitting caffeine (both coffee and green tea) would have such a powerful impact on my everyday life and how much I could enjoy each moment. For more information how quitting caffeine can help with anger management and moodiness, read here. Caffeine has also been linked to women's hormones. Personally, I have noticed how it affects my periods (menses). Caffeine makes the period pain worse and most likely affects the PMS as well. For more musings on this, visit my other article: "How to cure painful periods (menses) naturally". The same information is likely to be useful for menopause as well, and many other problems with women's hormones. There is an initial withdrawal period from caffeine, during which you will have less energy and feel less intelligent (!) but making the change gradually will make it quite doable and after about two weeks of being caffeine free - the latest - you should start feeling clear benefits. Generally the second day without has been the hardest for me and from day four I started feeling fine and experiencing the benefits of quitting caffeine. As a teenager I remember drinking sometimes 10 cups of black coffee per day while studying. Back in Finland drinking coffee really is a huge part of the culture. Perhaps quitting was easier for me since I live in England now, where coffee is less prominent and tea is preferred by many (I never had a taste for black tea). A definite help was the attitude of my boyfriend, who often commented how disgusting the coffee I was drinking smelled and looked like. He points out that if you leave coffee in a cup for a long time, it turns into a thick tar-like substance. That cannot be good for your body! 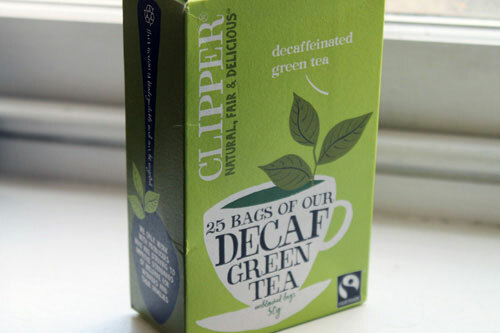 I have just discovered DECAF green tea as well, which I was extremely happy about, as I love the taste of green tea. In addition, I generally drink redbush (rooibos) tea, St. John's Wort 'happy tea', and chaga mushroom tea. I also love spice teas, such as liquorice tea from 'Yogi Teas', as well as strong lemon & ginger tea, which you can make fresh at home. And you can always treat yourself to fruit juices (with no added sugar or chemicals), which will give you a lift as well. (They also have plenty of calories which can stop you from needing snacks: more on this here: 21 Day Juice Fast). But be careful with fruit juices if you have unstable blood sugar or are addicted to sugar or carbs. The reason I took so long to quit caffeine was because I wanted to slowly get my mind used to not drinking caffeine - so that the process would be comfortable and I wouldn't feel deprived. And it worked. But during that time I had no idea how good I would feel when completely off caffeine and had I known, I probably would have speeded the process up, eager to get to the results. Once you quit caffeine, you will start to appreciate herbal teas much more. 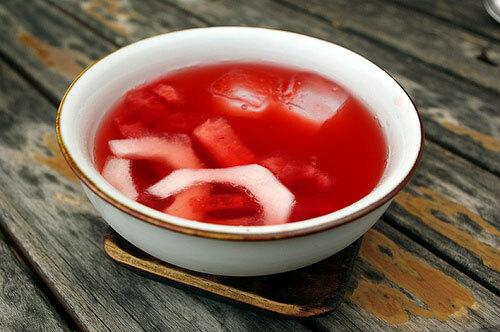 This image is of "Omija Hwachae" Korean tea, made of schizandra berries with slices of pear. But the main point is that I found that a gradual approach works. First moving to instant coffee only (which is weaker), then to 'Wake Up!' guarana-enforced grain-coffee substitute (still has caffeine in it but in a different form). After a while of getting used to this and happily drinking it I moved to non-caffeinated grain coffee, called Barleycup and available at health food stores. By then I had not yet completely given up coffee but was still drinking plenty of green tea, which has quite a bit of caffeine in it. Then I moved to drinking green tea only. Stephen Cherniske outlines an 'off-the bean programme' in his book Caffeine Blues, where he recommends mixing decaf coffee with normal coffee and slowly decreasing the dosage of the normal coffee, to make the process even more gradated. He also outlines a list of supplements which he says will help make the transition away from coffee, rebuild the adrenal glands, which get exhausted by caffeine, and achieve high natural energy as well as support the body to make exercise easier. The supplements are outlined in my book summary of Caffeine Blues but to get full dosage instructions you should buy the book. A clever move at this point - which I didn't do - would have been to move to Japanese green tea next, which is generally not as strong in caffeine as Chinese green tea. I have also found out that loose-leaf green tea is not as strong as that in tea bags. You can also gradually decrease caffeine by soaking the tea leaves less time each time, and using a smaller amount. Then gradually reduce the amount of green tea drank in a day. And after you feel completely happy and used to this, take the leap, suffer for some three days, and just drink spring water. At the beginning I felt that it was beneficial for me not to drink herbal teas as they only made me want green tea instead. I just drank water. If you really feel like you need a pick-up, you can have a banana. It helps. It has slow release sugar which gives your brain a buzz! Stephen Cherniske's book describes the adverse health effects caffeine has. It is a useful reference although in this article I like to concentrate on the positive. The benefits of quitting coffee, according to Cherniske, include: better nutrient absorption; strengthened heart, arteries and adrenal glands; better mental abilities and ability to cope with stress; increased energy, etc. But caffeine also causes dehydration, which - according to Barbara Wren - is one of the worst things you can do to your health at the cellular level. You can read my full book summary of Cellular Awakening here. A collection of quitting coffee -benefits from other sources, this list also includes the benefits I personally experienced, as listed above. Easier to wake up in the morning without needing caffeine to start the day. If you are tired for a natural reason, a very weak green tea will wake you up (although then you will risk getting readdicted). No energy slumps during the day, unless you are very tired for a natural reason or unless you eat very hard-to-digest heavy food. Stronger central nervous system after quitting coffee. Quitting coffee will help to strengthen the liver and the adrenal glands. Healthier and whiter teeth after quitting caffeine. Stop supporting the cutting down of rainforests for coffee farms. Stop supporting unfair labor on coffee farms (see trailer of a documentary on this below). Quitting coffee will enable a better absorption of nutrients. Less digestion-related problems, such as heart burn, which can be caused by coffee. Better hydration and thus all the body functions get better. Quitting coffee can be the first step to stopping the aging process, as suggested by the Hippocrates Health Institute Director, Dr. Brian Clement. Quitting coffee contributes to better blood sugar balance. Quitting coffee may contribute to reduced belly fat. Better skin. Drink plenty of water to speed this benefit up. Taste buds adjust and eventually coffee doesn't smell or taste nice anymore, as other flavours become preferred (long-term benefit). Black Gold: Wake Up and Smell the Coffee - trailer. The full documentary be purchased at Blackgoldmovie.com or on Amazon (link below) - this should inspire you to quit coffee! Update from July 2014: Since I quit caffeine, my health journey has had quite a few different turns. I found out that I had adrenal insufficiency as well as tendency to hypoglycaemia. So despite having these fatigue-causing conditions all along, I still experienced the benefits detailed above from quitting caffeine. These are fairly common conditions but if you don't suffer from them, the benefits you receive from quitting caffeine will quite possibly be even more pronounced. 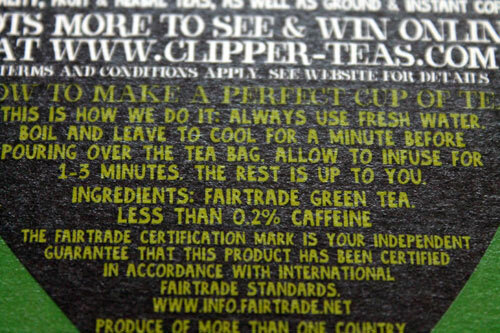 A word of warning, also, on the decaf green tea. I found out that it still has caffeine in it! But because the caffeine content is reported as percentage I find it difficult to compare it to the caffeine content of normal green tea, which is usually given in milligrams. I also developed anxiety again later temporarily, because of certain supplements, copper detox, sugar addiction and reasons of lifestyle (stress) but that was a separate issue from the underlying caffeine-caused anxiety and unexplained sadness, which went when I quit caffeine. How quitting caffeine can help to combat belly fat due to less cortisol production. Natural Health Remedies for Anxiety, Addiction, Tiredness, Food Intolerance, Headaches, Migraines, Mental Health Problems, Allergies, Hormone Imbalance (women). For an extreme case of caffeine allergy, this is an interesting article published at the Hippocrates Health Institute website: Mental Illness or Caffeine Allergy?